Ten Army Cadets and a Sea Cadet travelled to St John Ambulance’s historic headquarters in Clerkenwell London on Saturday (12th May) to receive the prestigious Young First Aider of the Year Award. 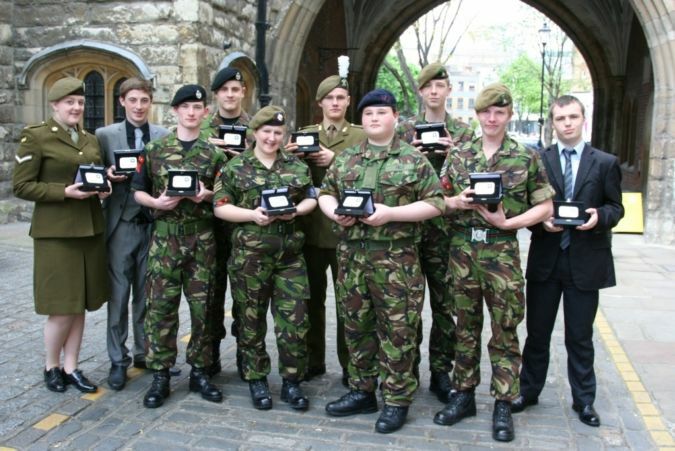 Open to young people from schools, youth organisations and even nominations by parents and family the 11 services cadets emerged successful amongst just 14 young people chosen to receive the awards. Chief Officer (Volunteers) for St John Ambulance, Ian Mackenzie, presented the cadets with the award in recognition of their quick thinking and use of first aid. Aaron Field (Middlesex & NW London) was faced with stopping the bleeding from a severe injury when his dad put his arm through a window. Rebecca Love from Staffordshire & West Midlands North ACF intervened in a serious assault where two people were badly beaten. As well as rendering first aid Rebecca took down the registration number of the assailant’s car as he fled and helped ensure his subsequent conviction. Deane Little from Essex ACF had to perform CPR on his granddad. Ryan Speight and Michael Stanton both dealt with an assault victim and then found another unrelated casualty. Adam Williams from Gwent & Powys ACF had to look after his own brother who sustained a severe head wound and five spinal fractures in a biking accident. Dominic Pearson and Ioannis Woodruff dealt with a road accident on their way to cadets. Sea Cadet Kimberley Stubbs had to deal with a serious accident at her trampolining club. Lt Col Alan Sharkey, Chairman of the ACFA First Aid Panel, said “all the cadets stood out for their willingness to act and take responsibility when others didn’t, and for their St John Ambulance first aid skills acquired as part of their cadet training”.